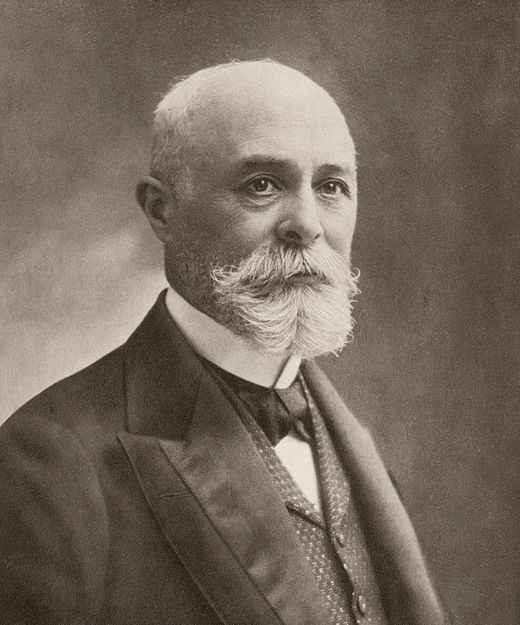 Becquerel was part of a French scientific family that included several generations of respected scientists. He was born in Paris on December 15, 1852, the son of Alexandre­ Edmond Becquerel, who had spent his career studying the rotation of polarized light by materials in magnetic fields. Henri took up that study himself while also working for the Department of Bridges and Highways, for which he was appointed chief engineer in 1894. It had been known that solids and liquids could route the direction of polarized light, and the young Becquerel showed for the first time that gases could do the same with light. When Becquerel became a professor of physics at École Polytechnique in Paris in 1895, his main interest was the phenomenon of phosphorescence, the property of some materials to glow for a while in darkness immediately after they are exposed to light In particular Becquerel studied the phosphorescence from some uranium compounds, which he assumed needed exposure to sunlight before they would glow. At the end of 1895 the German scientist WILHELM ROENTGEN discovered that mysterious, invisible rays—which he called X­rays—could be produced in a laboratory. It is now known that they are emitted when fast electrons, accelerated by a high voltage, smash into a glass or metal target. When word of Roentgen’s discovery reached him in 1896, Becquerel wondered if phosphorescent materials might also give off X­rays. As a test he placed crystals of uranium compounds in bright sunlight on photographic plates that were well wrapped with dark paper. Sure enough, the plate was exposed, suggesting that an invisible, penetrating radiation was released by the crystals. He repeated the experiment, this time with the crystals and plates in a dark drawer, expecting the plate to stay clear. To his surprise, though, the plates were exposed, just as in the previous experiment. In later experiments he found that pure uranium metal would expose the plates even more strongly than the phosphorescent salts. MARIE CURIE named the phenomenon radioactivity and made it the focus of her research with her husband, Pierre. Before the year ended, though, ERNEST RUTHERFORD in England showed that at least some kinds of radiation are electrically charged bits of matter By 1900 Becquerel succeeded in measuring the deflection of beta particles and showed that they were the same as electrons. He also inadvertently discovered the physiological effects of radiation in 1901, when he reported a burn from carrying a sample of radium in his vest pocket. Becquerel shared the 1903 Nobel Prize for Physics with the Curies. He died in Le Croisic, France, on August 25, 1908. As the first to discover radioactivity and that one component of some radiation, the beta particle, was made of electrons, Becquerel can be considered an ancestor— perhaps the great­ grandfather—of the nuclear age. In Becquerel’s lifetime, scientists were regularly producing all kinds of unknown rays from vacuum tubes connected to high voltage. Those rays were dearly the result of the experimenters action: turn off the power, and the rays stop. In contrast, the rays he discovered emanating from uranium and other minerals came out on their own, from the samples themselves. Figuring out where that energy came from and what it could do spurred the investigations of several generations of scientists, starting with Marie and Pierre Curie. The Curies’ studies completed Becquerel’s work. They demonstrated “disintegration,” the breaking apart of a radioactive atoms nucleus that resulted in the emission of heat and subatomic particles. Other scientists focused quickly on the significance of their findings. Ernest Rutherford characterized the atom as a nucleus surrounded by orbiting electrons in 1911, and NIELS BOHR proposed that electrons circle the nucleus at specific levels of energy in 1913, thus marking the beginning of nuclear physics. Many applications exist today that are rooted in Becquerel’s work. Radiation from radioactive materials is used to sterilize food, to measure thicknesses of metal and plastic sheets in industry; and for treating many kinds of cancer. Radioactive materials themselves are sometimes administered to patients for diagnosis and treatment of some diseases, and radioactive materials have been essential as tracers to decipher complex biological and chemical reactions. Becquerel could not have imagined any of these uses, but they are all descended directly from his work more than 100 years ago.